IPKN | May our skin grow beautiful, as we grow wiser. Contains ECOCERT certified lavender, chamomille, rosemary, water chestnut extracts to provide nutrition and deep hydration to the skin. It isn’t a conventional skin mist as fine particles and nano-technology is incorporated to enhance maximum penetration of products. 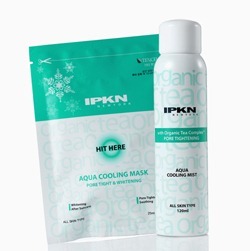 Peppermint, menthol, aloe vera,and lemon extract works in synergy to calm down the skin’s temperature , while tightening pores, giving your skin a cool, fresh and calm effect. Soothes skin instantly, shrink pores and contains whitening essence to brighten up the skin. Notice that there is a ‘tap here’ on the centre of the mask. Tapping it will activate a diminuation of temperature by 3-5 degrees to cool down skin damaged from long exposure under the sun. I know this has been old news, but would like to follow up on the IPKN controversy. Tests conducted by the Department of Health on South Korean-produced IPKN BB Cream, which made the news recently after it made a woman glow under black light, showed that while the product contains ingredients with fluorescent properties, the substances were not harmful. Blemish balms, commonly known as BB cream, have become popular in recent years, as the product combines foundation, sun protection lotion and moisturizer in one mixture. Food and Drug Administration (FDA) Director-General Kang Jaw-jou (康照洲) said a chemical substance called disodium phenyl dibenzimidazole tetrasulfonate found in the cream acts as a sun protection agent. The substance gives off a fluorescent glow under ultraviolet light, but the fluorescence has nothing to do with whitening agents that can harm the body or increase the risk of cancer. “Many chemical substances have fluorescent properties … the glow itself is not enough to determine whether [a substance] is safe or not,” Kang said. The FDA said that because the substance was not known to pose health risks, its use in cosmetic products was fully legal in Taiwan, as well as in the EU, Australia and many other countries. On Monday, reports said a Taiwanese woman who had used the cream discovered while in a nightclub that her face was giving off a bluish fluorescent glow under the black light. The sheen made her fear the product could contain harmful substances or have unexpected side effects. Fluorescent agents can be added to some products to increase their whitening property. Because there is no consensus on whether fluorescent agents can cause cancer, however, most countries do not ban them in cosmetic products. Although health authorities did not find that the sun protection ingredients contained any hazardous substances, inspectors said they would continue testing to ensure that other BB cream products sold in Taiwan are safe. An official at the Department of Health (DOH) said public health offices have gathered samples of blemish balm cream, commonly known as BB cream, for examination following a media report that some of the products being sold in Taiwan stores have been found to have contained fluorescent dyes. Chang Chi-jui, section chief of the Medical Devices and Cosmetics Division at the Food and Drug Administration under the DOH, said the product samples collected yesterday morning will undergo close examination to determine if they contain optical brightener. The product that has been highlighted is the IPKN (Independent Professional Korea New Yorker) BB cream from South Korea, where the product takes fourth place in terms of market share. The Cosmed chain store selling cosmetics and medicines in Taiwan started offering the product in January. But many consumers have bought the product via the Internet. Separate tests by two inspection agencies and a university professor showed traces of optical brightener. However, the importing company of the IPKN BB cream said their products have passed the examination of SGS with negative test results for fluorescent dyes. Chang said no conclusion has been reached concerning whether fluorescent dyes may cause cancer. No nation has prohibited the use of such chemicals in cosmetics, he said. But the labs of the DOH will carry out tests to allay consumers’ concern and find the truth, Chang said. He said the supplier did not specify that the product contains the chemical substance when it completed applications to enter the local market. But the importer will be fined up to NT$100,000, and products will be removed from store shelves for violating the labeling regulations with a discrepancy between product and label, if fluorescent dyes are found in the products, he said. Some toxicologists at leading hospitals and chemistry professors said fluorescent dyes could cause allergy or even cancer, or harm organs like the liver and kidney, when toxic substances are released from the product. Chang said the DOH will gather relevant information for discussion by a panel of cosmetics experts to determine whether to ban the use of the products. BB cream started off as a soothing treatment balm, which dermatologists and surgeons used on patients who underwent laser skin operations. Suppliers said the product represents a recent breakthrough in combining skin care and makeup. Many women in Taiwan have joined the fad after some Korean actresses began to promote the product for sponsors.